↑ Reddy 1977, p. 144 "(i) Accused George Mathew Fernandes (hereinafter referred to as George Fernandes Al) was the former Chairman of the Socialist Party of India and also the President of the All India Railway- men's Federation." ↑ "George Fernandes, Former Defence Minister, Dies At 88 After Long Illness". NDTV.com. 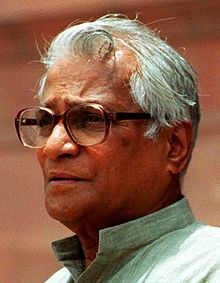 29 January 2019. https://www.ndtv.com/india-news/george-fernandes-former-defence-minister-dies-at-88-after-long-illness-1984690. Retrieved on 29 جنوری 2019. ↑ Sharma, Surender (1 July 2010). "By George! It's out on the street". میڈ ڈے. https://www.webcitation.org/query?url=http%3A%2F%2Fwww.mid-day.com%2Fnews%2F2010%2Fjul%2F010710-Catfight-George-Fernandes-property-Jaya-Jaitley.htm&date=2012-03-02. Retrieved on 3 ستمبر 2010. "As if it had not earned enough bad name and publicity for one of the most veteran politicians and trade unionist George Fernandes, claimants to his legacy slug it out in streets on Wednesday." ↑ "Biographical Sketch (Member of Parliament: 13th Lok Sabha)". بھارتی پارلیمان. https://web.archive.org/web/20100812115404/http://www.parliamentofindia.nic.in/ls/lok13/biodata/13BI34.htm. Retrieved on 12 September 2010. ↑ "Shri George Fernandes General Information". Government of Bihar. https://web.archive.org/web/20110722111252/http://www.biharonline.gov.in/Site/%28S%28oabm5t45q1vrvv3w2vs2afv2%29%29/Content/Government/Government.aspx?u=R6&ln=en. Retrieved on 3 September 2010. ↑ "Fernandes: Popular but controversial minister". برطانوی نشریاتی ادارہ. 15 March 2001. https://www.webcitation.org/65tExQoD2?url=http://news.bbc.co.uk/2/hi/south_asia/1223625.stm. Retrieved on 3 ستمبر 2010.